Twice a month, usually on the first and third Thursday of each month, I bring a jazz quartet up from Boston for an evening of original and improvised music at Spice Thai Kitchen. Our audience and other diners gather at 7:00 pm for two sets of live music in this warm intimate space. Over these past seven years — through this gathering around friendships,Thai food, and heart-felt music — a true community has blossomed. In the spaces between the songs, as I introduce the musicians or the provenance of the tunes, our audience often chimes in, with humor, questions and comments. And, in this comfortable way, we have gotten to know and appreciate one another. I work to bring new music that I write or arrange, and new combinations of musicians and instruments to this venue, so that the music is always fresh. I believe that there is a need for musical beauty and excitement in our lives. And as a musician, I am committed to the type of listening that enables the deepest of interconnections. 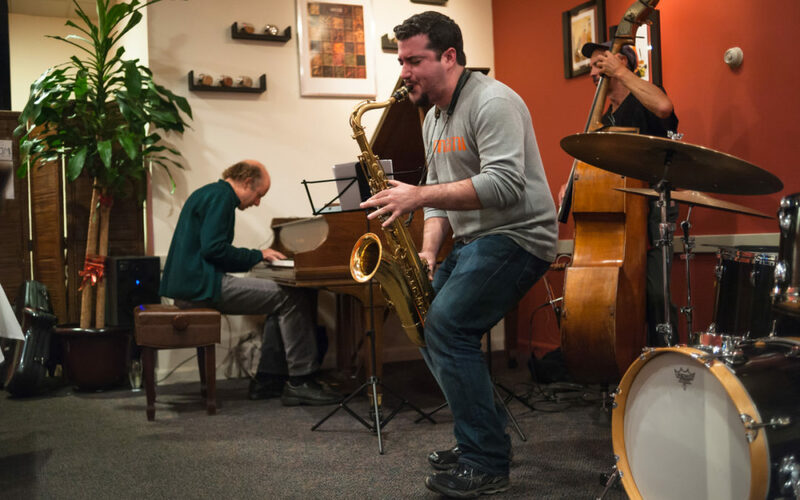 When I brought my 5-foot Mason and Hamlin grand piano to Spice seven years ago, I had no idea that these Jazz-nights would foster so much good will. But it is something that I am most proud of and grateful for. I hope you will consider joining us some Thursday soon at the Thai Spice Kitchen.